When Mike Mignola first imagined Hellboy nearly 25 years ago, the demon was a little bit different to what we now know as the iconic character. But now Mondo are taking that original artwork and turning it into an awesome figure — one that looks just like the original artwork. Unlike their previous Teenage Mutant Ninja Turtle figure, alas, Mondo’s new Hellboy isn’t articulated (even though they still call it a figure), but that doesn’t stop it from looking amazing. Although some of that trademark Mignola heavy shading isn’t there, it’s pretty much a perfect recapturing of the original artwork, on a 3D body. I’m a total sucker for this effect, and no matter how many times I see it, it looks great every time. 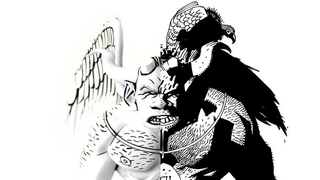 The 12” statue will come in two variations — a Black and White version exclusive to Mondo with a run of 200, and the above colour version, designed by Hellboy colourist Dave Stewart. Either way, it’s a very pretty statue. But such prettiness comes at a price — the colour version of the statue will set you back a hefty $200 upon its release later this year, while the Mondo exclusive black and white version will cost $225. Pray for your wallet now if you end up going for either one of these.